Research has proven that routine screening can help prevent deaths from oral cancer. Oral cancer screening exams are important, simple tests that people should have done each time they are in the dentist’s chair. This simple exam can help detect cancer at its earliest stage, when the chances for successful treatment are the highest. At Gold Hill Dentistry, we are proud to be a fully comprehensive dental practice in Fort Mill, South Carolina. Our main focus is the long-term well being of your mouth and teeth with an emphasis on the connection of mouth and body. Your overall health is not separate from your oral health, and vise versa; therefore, we take into consideration all aspects of our patients’ health to ensure they receive the highest quality care. Dr. Kavi Sagunarthy and Dr. Jennifer Mokris lead our dental practice as experienced dentists who are committed to delivering the highest standard of personalized care to each patient. As a part of this commitment, oral cancer screening is just one way that we take measures to ensure that our patients are well taken care of. During a routine dental exam, your mouth can be quickly screened for any signs of cancerous or precancerous development. By simply examining the tissues of the entire mouth for sores, white or red patches, lumps, or thickening, the dangers of premature death by oral cancer can be caught early. Gold Hill Dentistry was designed with our patients’ well being in mind, and we do all that we can to ensure that your health is at the forefront of all we do. 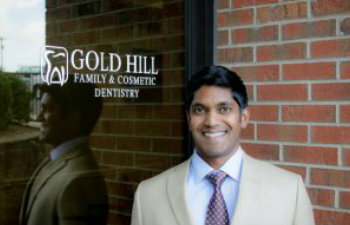 If you are here in Fort Mill or the surrounding areas and are looking for a family dental practice that goes above and beyond simply cleaning your teeth, Gold Hill Dentistry is here for you. We look forward to building a long-lasting relationship with your family as we care for your smiles. Call today to schedule an appointment.